Remember how I last raved about my new found obsession with Elie Tahari here? Well, turns out this love runs deep and goes way beyond their workwear line. 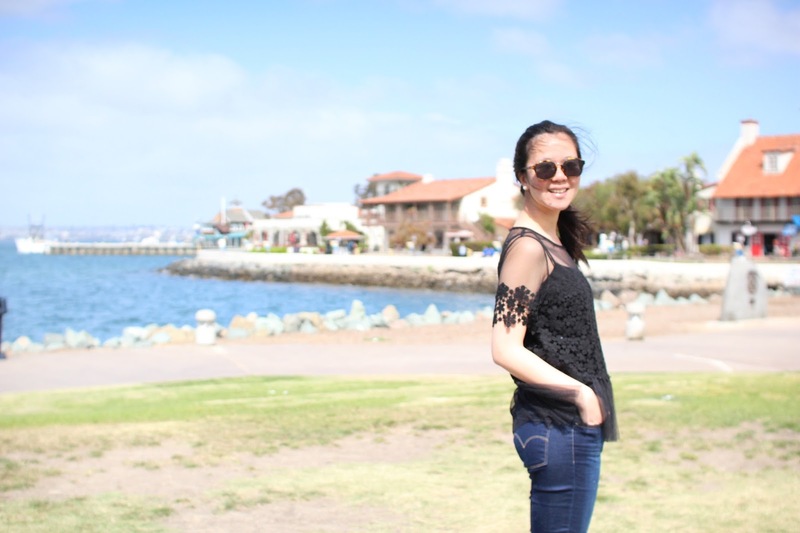 Case in point - this lovely floral lace applique top, which has easily and rather quickly become a closet favorite. I love how it's more interesting than your run of the mill black top yet plain enough to go with most everything in your closet. The kind of top that you pack in your suitcase half way across the world because it not only makes for a great day to night piece but also seamlessly transitions your outfit from girly to cool with the right accessories. Like my recent trip to San Diego here - I wore it with an army jacket and the world's most comfortable pair of shoes (I call them my cloud shoes) while wandering around during the day. Come nightfall, I amped it up for a date night with a red lip and this breezy asymmetrical skirt.